Repetitive motion injuries are much more common in today’s world, where people use computers, mobile devices and phones for extended periods of time, or are often sitting for much of the day in the same position. 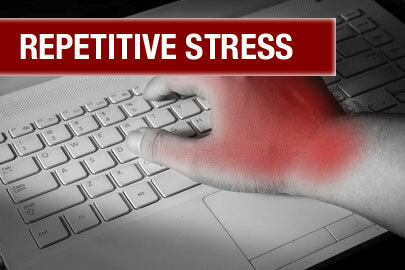 Perhaps the most commonly known RSI is carpal tunnel syndrome, but these types of injuries can impact many parts of the body and cause great pain and discomfort. In our pain management centers throughout Philadelphia, we treat carpal tunnel and other repetitive motion injuries. We can assist you in recovering from the pain and getting back to productivity. Proper ergonomics in the workplace can help reduce these injuries, as can taking extra breaks to walk around, stand more, and alter the activities being performed consistently. In some businesses, there has been an increase in the use of “standing desks”, to encourage the worker to switch between sitting and standing throughout the day, alleviating pain that can occur in the back, legs, and other parts of our bodies. POSSIBLE TREATMENTS for this kind of pain can include ice and rest, as well as professional adjunctive therapy to help the body’s muscles recover properly. Here at Tri County PMC, we can also advise you on other forms of treatment. Contact one of our local offices if you think you are experiencing some form of repetitive motion injury.